TEHRAN: Iran's Supreme Leader Ayatollah Ali Khamenei on Friday demanded an end to street protests that have shaken the country since the presidential election a week ago and said any bloodshed would be their leaders' fault. He defended Mahmoud Ahmadinejad as the rightful winner of the vote and denied any possibility that it had been rigged, as Ahmadinejad's opponents have alleged. "If there is any bloodshed, leaders of the protests will be held directly responsible," Khamenei said in his first address to the nation since the upheaval began. "The result of the election comes from the ballot box, not from the street," the white-bearded cleric told huge crowds thronging Tehran University and surrounding streets for Friday prayers. "Today the Iranian nation needs calm." Supporters of runner-up Mirhossein Mousavi have called another rally on Saturday. If they proceed in defiance of Khamenei's explicit warning, they risk a severe response from security forces, which have so far not tried to prevent mass demonstrations. Mousavi has called for the annulment of the election result, which showed he won 34 percent of the votes to Ahmadinejad's tally of nearly 63 percent. Iran's top legislative body, the Guardian Council, is considering complaints by the three losing candidates, but has said only that it will recount some disputed ballot boxes. Khamenei said any election complaints should be raised through legal channels. "I will not succumb to illegal innovation," he said, in an apparent reference to the most widespread street protests in the Islamic Republic's 30-year history. 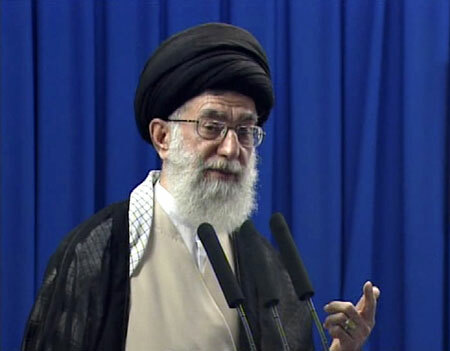 Khamenei's address followed six days of protests by Mousavi supporters. On Thursday, tens of thousands of black-clad marchers carried candles to mourn those killed in earlier rallies. He said defeated candidates were wrong to believe "that by using street protests as a pressure tool, they can compel officials to accept their illegal demands. This would be the start of a dictatorship." He dismissed charges by Mousavi supporters of fraud. "Iran's laws do not allow vote-rigging, especially at the level of 11 million," he said, referring to Ahmadinejad's victory margin. The enemies of Iran, the world's fifth biggest oil exporter, were targeting the legitimacy of the Islamic establishment by disputing the outcome of the election, he said. State television coverage showed Ahmadinejad and defeated candidate Mohsen Rezaie attending Khamenei's speech. There was no sign of Mousavi or two former presidents who have backed him -- reformist Mohammad Khatami and the powerful Akbar Hashemi Rafsanjani, who clashed with Ahmadinejad before the election in a rare display of leadership division. The supreme leader, Iran's ultimate authority, in theory stands above the factional fray, but Khamenei acknowledged his views on foreign and domestic policy were closer to those of the hardline Ahmadinejad than of Rafsanjani. He attacked what he called interference by foreign powers which had questioned the result of the election.